Hello from Peter and Jacquie Watson, and welcome to South West Alpacas. We decided to set up an alpaca farm when we moved to our 27-acre smallholding in Devon some years ago. We looked at more conventional livestock options, such as sheep and cattle, but saw a lot of problems compared with the apparent attractions of keeping alpacas. Then we saw some beautiful alpacas for sale, and just couldn't resist! However, after more than ten years spent working with these adorable animals, we have decided to retire. Fortunately, we have been able to find new homes with caring owners for all our alpacas, so we can set off to do some serious traveling with a clear conscience! We will leave this website live for the forseeable future to allow all who are interested in our experiences with alpacas over the past decade to share in our enjoyment of these wonderful and engaging creatures. "If only we knew then what we know now!" Playtime in the sun. Click on the image to see more cria at play ! We bought our first alpacas in Devon nearly a decade ago. 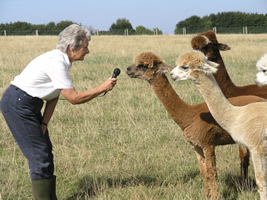 Recently, International Camelid Quarterly asked us to write an introductory article on setting up and managing a small herd for people just starting out with keeping alpacas. It's a good starting point if you're thinking about buying and keeping alpacas, and want to know what is involved in running an alpaca farm. alpaca experts at South West Alpacas in Devon. If you'd like to know what happens to the lovely Alpaca fibre, visit our Isles of Avalon website, where we display our unique range of luxury alpaca knitwear and yarns. Produced in very limited quantities, our exclusive garments have been specially designed to take full advantage of the unique properties of alpaca fibre. All our garments are individually made and carefully hand finished, using the finest alpaca yarns specially selected by us to ensure the highest level of quality, comfort and style. Our hand knitted garments are individually crafted Devon using only the softest luxury baby alpaca or baby alpaca and silk mix yarns. They are based on my own designs which incorporate traditional lace and stitch patterns. 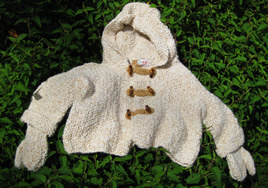 Many of the baby and children’s garments are knitted from my memory of the traditional designs used by my mother and grandmother, which lend themselves well to the softness and warmth of baby alpaca. Some others are my interpretation of designs in an Italian baby-wear boutique we saw whilst on holiday. Beautifully soft and warm, these delicate alpaca handknit garments are a very special gift for a very special little person. We now offer a unique range of very special natural alpaca yarns. Our own Isles of Avalon range is spun from the very finest baby alpaca fibre to make a luxurious yarn with the extreme softness and subtle lustre only the best alpaca can offer. Four yarn types are available, each with its own unique character. 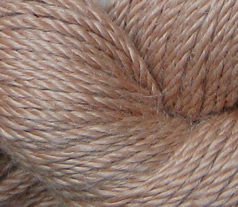 Three of the yarns are made from the finest undyed, unbleached natural white fibre, and are ideal for hand dyeing. The forth yarn is our latest addition to the range - pure baby alpaca from the fleeces of three individual animals from our own farm, spun locally. Available in the natural fleece colours of Dark Chocolate, Medium Fawn (shown above) and Light Cream. Admittedly, not much to do with keeping alpacas - but we all need a holiday sometime!